I had begun mourning the absence of chili in our household. Sure, my husband and I would occasionally make a batch, but it had become a strictly grown-up indulgence relegated to a cold fall or winter weekend when the kids were invited out to a birthday party or had other away-from-home plans. 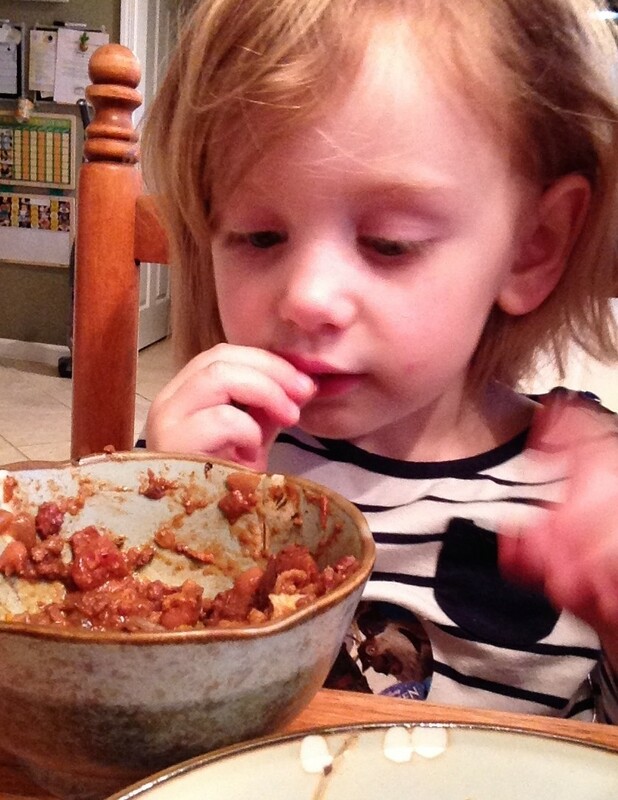 Chili — our chili, at least — was always “too hot” or “too spicy” or “too…beany” for them. If we were lucky — and the pot of chili was a particularly mild one — we could convince them to have a little over nachos as long as we also loaded them up with cheese and sour cream. But I puzzled a bit over this considering that black beans cowboy style got a green light, and chili wasn’t much of a departure from that familiar dish. But with Father’s Day coming up we took on the challenge of retooling our chili to make it both flavorful and kid-friendly. We’re lucky that our Stout Sprouts show a growing interest in helping in the kitchen — that made this experiment a little easier since they got to measure, stir, cook and eat. And, did I mention the chocolate? And the bacon? Yea…pretty much a winner out of the gate. Now, there are few foods seeped in as much lure and conjecture as chili. It is a dish synonymous with Southwestern cuisine, though stories of its origin are extremely murky. According to the International Chili Society, using chile peppers to flavor chunks of meat goes all the way back to the Aztecs and the Incas, but there are others who attribute the invention of chili to trail drive cooks in Texas in the 1800s. Even today there are few cook-off events that inspire more debate than chili competitions. Camps square off around things like the type of meat used (beef? poultry? ), the cut of meat used (cubed? ground? 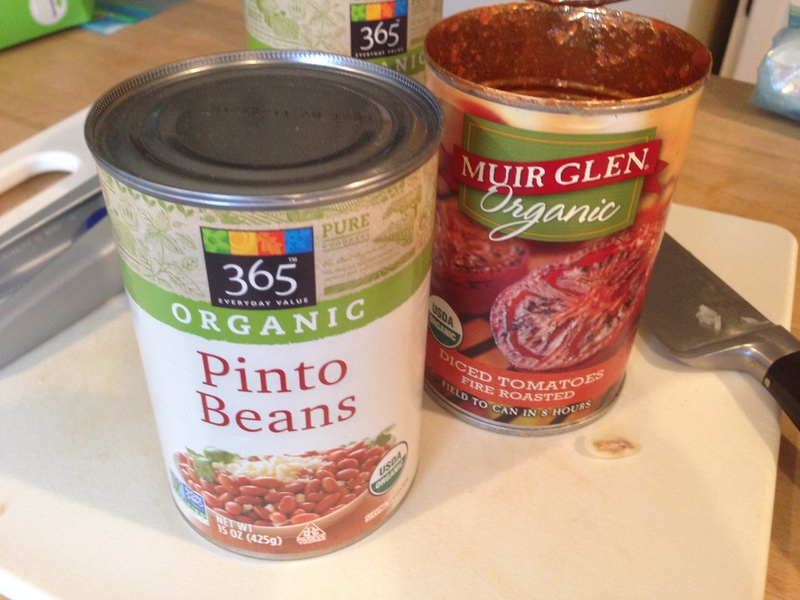 ), and whether the recipe should include tomatoes or beans (and if so, pinto? or black? or kidney?). And don’t even begin to ask about the super-secret spice blends that may — or may not — include things like ancho chiles, chipotles, chili powder, cumin, cilantro, oregano, salt, and pepper. Many good chilis proclaim their merits by how many Scoville units they pack into a single bowl. The Scoville scale measures the heat of things like chile peppers and other spicy foods. Kids, however — and mine in particular — shudder at mere mention of the word “Scoville.” (Just try it…you’ll see.) The scale goes from the laughable “no significant heat” of a bell pepper to the 2,000,000 units of the hybridized “Caroline Reaper” chile pepper. For my kids, “no significant heat” is still too spicy for them. What to do, what to do. 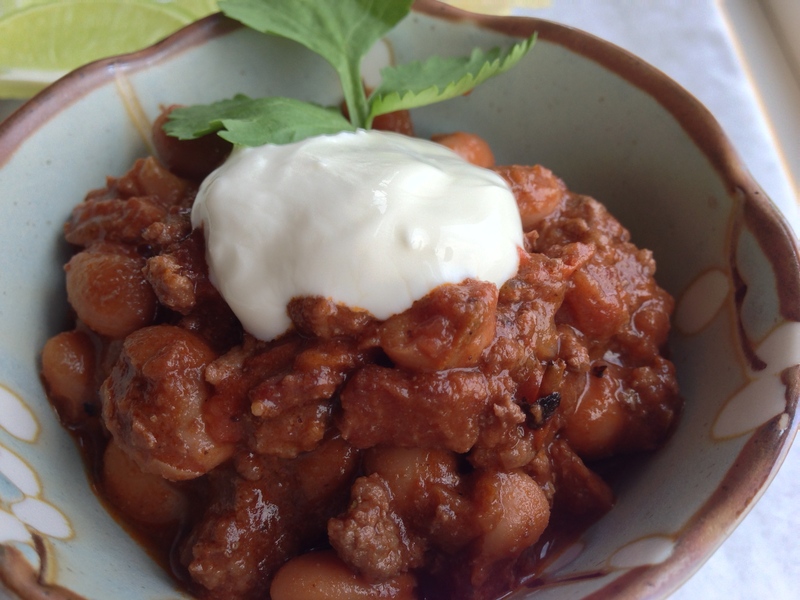 Especially after coming across the tantalizing but spicy recipe for Triple Chocolate Beef and Bean Chili published in the February 2013 issue of Saveur Magazine. Well, I’ll tell you what we did. We harkened back to our “regular” All-American Chili recipe published in the January 2003 issue of Cooking Light and used some the the tricks learned there (using ground beef, and a fruity wine in the broth), combined with the flavor profile of the Saveur recipe. We steered clear of anything too spicy (ah, anchos, how I’ll miss you), but brought in ingredients like fire-roasted tomatoes, Dutch-process cocoa and bittersweet vs. semisweet chocolate to add complexity and depth to the dish. The result? Success worthy of any dad. Just in time for Father’s Day. So, if your Father’s Day celebrations take you into the kitchen (and you’ve eschewed the grill for a change), give this recipe a try. Not only will it make dad happy, but even the youngest progeny will lick their bowls clean without a single complaint of tingling tongues or the need for a giant glass of fire-quenching milk. Unless, of course, that’s what you’re serving with this! In a large Dutch oven over medium-high heat,cook the ground chuck until it begins to brown. Using a slotted spoon, remove the chuck from the Dutch oven into a clean bowl. Drain off any accumulated liquid. Add the bacon to the Dutch oven and cook until it is crispy. Using the slotted spoon, remove the cooked bacon to the same bowl with the cooked ground chuck. Drain off all but 1 tablespoon of bacon grease. Reduce heat to medium and add the onions to the Dutch oven. Sauté until the onions are quite soft. Add the tomato paste, cocoa powder, cumin, oregano, cinnamon, and chili powder and sauté briefly to bloom the spices. Add the garlic and sauté for another 1 – 2 minutes. Season the onion/tomato paste/spice paste with several generous pinches of salt and grinds of fresh black pepper. Add the wine, diced tomatoes, pinto beans, chicken stock (or water), bay leaves, and the reserved cooked ground chuck and bacon. Adjust heat so that the chili gently simmers. Stir occasionally and lower the heat if the chili begins to stick to the bottom of the pan. When the chili has simmered for approximately one hour and the broth has thickened considerably, remove and discard the bay leaves and add the bittersweet chocolate. Stir well and allow the chocolate to melt into the chili. Simmer for another 5 – 10 minutes to meld flavors and serve hot, accompanied by sour cream, lime wedges, finely-minced fresh cilantro and hot sauce if you want it. 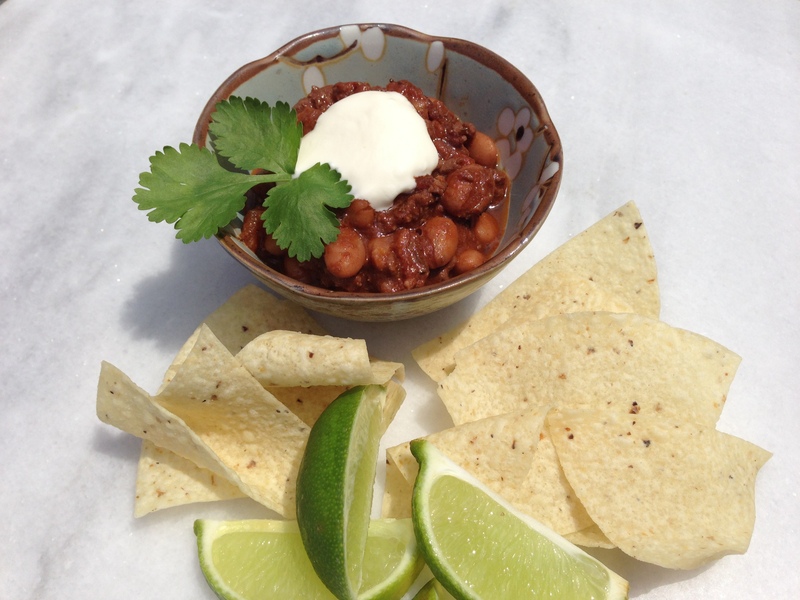 Tortilla chips are great with this chili, or serve with fresh corn bread. Parent rating: four-and-a-half stars. What this chili lacks in heat it more than makes up for with complex flavors. The deep, warming taste of chocolate really comes through without it being too sweet. 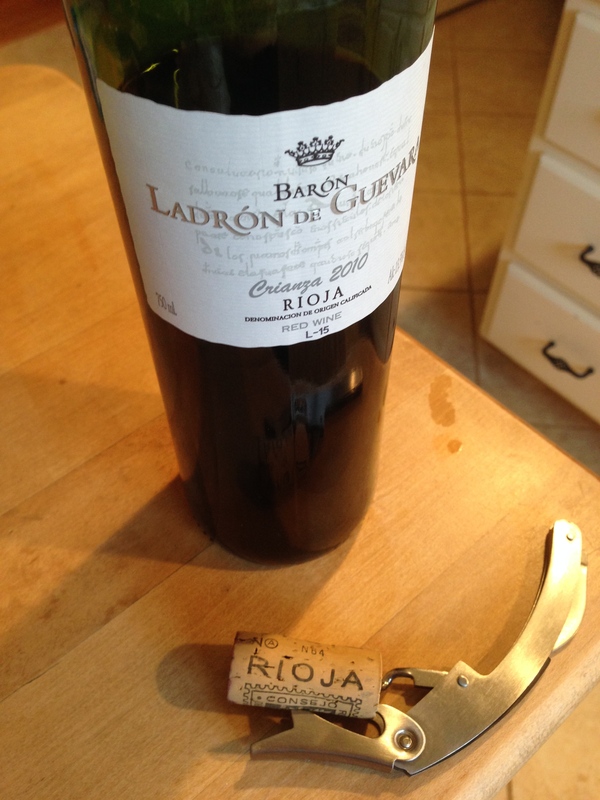 The wine adds body, and the fire-roasted tomatoes add a complementary smokiness. Both my husband and I sprinkled on liberal amounts of Frank’s Hot Sauce and an extra grind or two of salt and pepper to give the dish a little more pop. I loved this chili and look forward to finally ending the chili drought that has gone on around here for far too long. That alone is a great Father’s Day gift, I think. Is it a bad thing that my mouth was watering just READING this post? 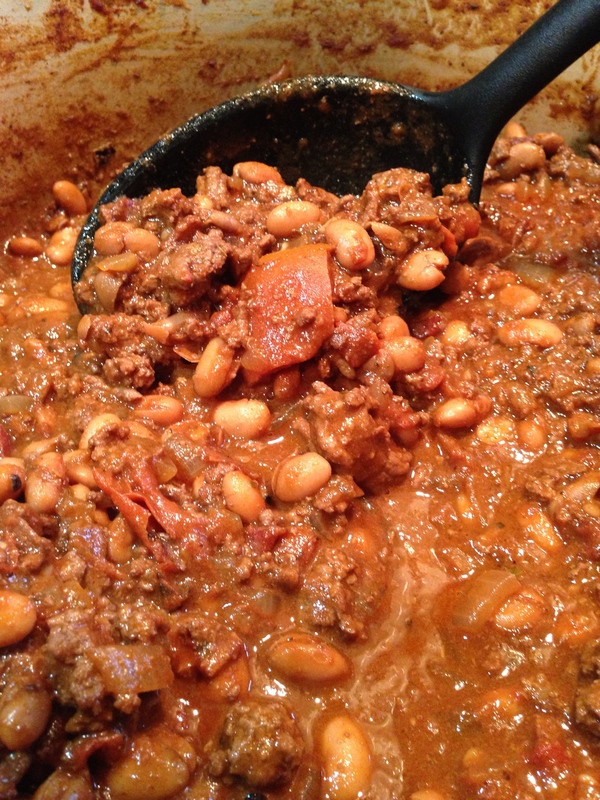 I love the recipe and your perseverence with your children to come up with a chili that everyone loves! Thanks Betsy! I was glad to finally come up with a chili the whole family likes…but to be honest, you really can’t go wrong with a recipe that includes chocolate, bacon, cinnamon and wine. Something for everyone! If you make it, let me know how it goes over in your house! Hi Kit. The recipe never says when to add the bacon and beef back into the chili. Can I assume it’s at the same time as the wine, et al. Hi Peter! Yes, the beef and bacon go back in with the liquids and tomatoes and simmer for a bit to blend all those wonderful flavors. Great catch! Thanks for being an excellent recipe tester. I’ve updated the post with that correction!